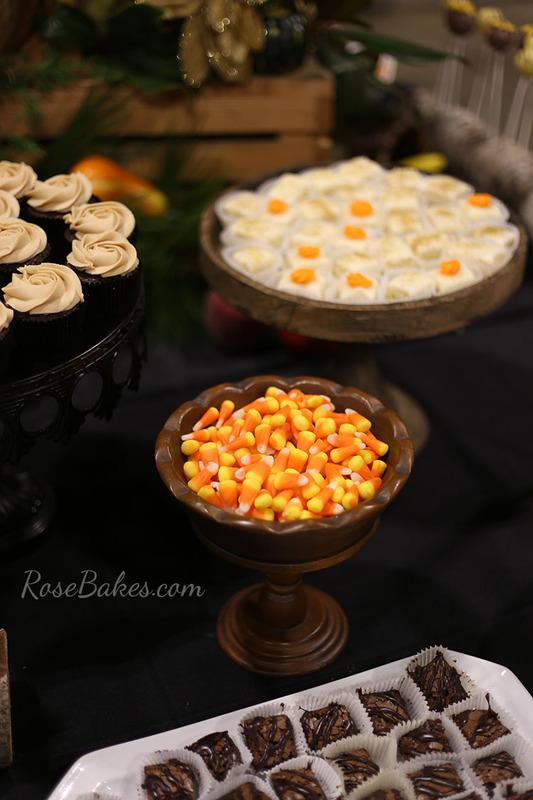 Today is Day 21 of the Write 31 Days Challenge and I want to share the Fall Dessert Table I did last night! If anybody’s counting, I missed another day of the writing challenge yesterday but it was not my fault. 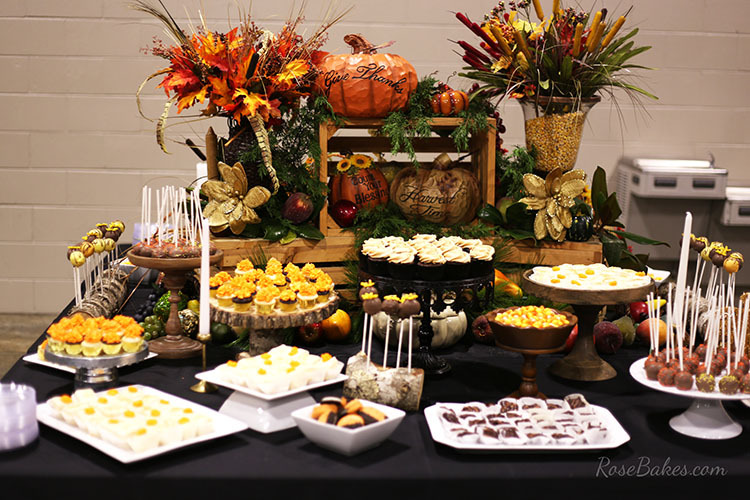 You see, while we were out at the event where I did this fall dessert table, my kids were home and the power went out. When we got home hours later, it was still out.. til 1am! Around 11pm I gave up and went to bed. No electricity = no internet = no blogging. But you know what it equals? A full nights sleep! I have felt pretty yucky all week but I woke up this morning feeling really good and rested for the first time in days! Yay for silver linings! Okay… let’s talk about the table! This was the front of the dessert table, if it had a “front”. My fantastic, beautiful sister-n-law did the centerpiece for the event. It was in the center of a huge square of tables and then the desserts went all the way around all sides. We learned a couple of years ago that when you have this many guests, you don’t want all the desserts on one long table because then you end up with long lines. By spreading it all around a huge square, guest can walk up to any side and pick what they want. It works beautifully! We used a mixture of colors and textures… white dishes, stumps and logs, some silver, some wood, some black. 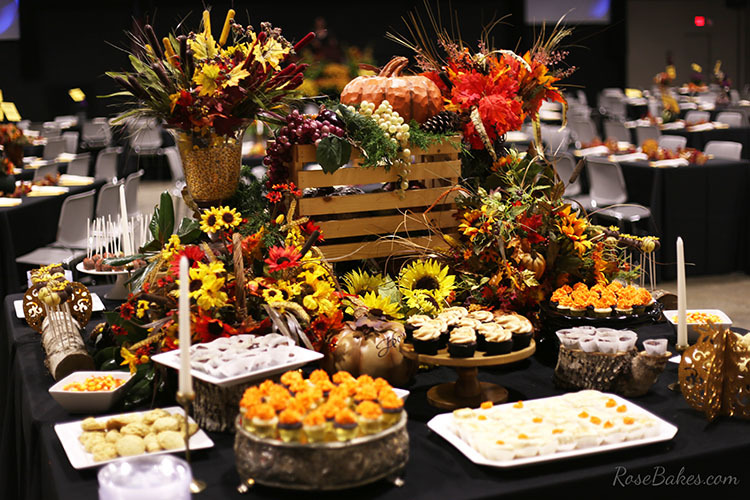 We wanted a “dressed up” rustic look with fall colors! I don’t know the exact number, but there were 830+ pieces of dessert. I honestly am not sure if there’s a “right way” to calculate how much dessert you’ll need for something like this but my goal was 750 pieces – assuming the average person would walk up to the table and put three 3 things on the little dessert plates. Because I couldn’t calculate exactly how many things would come out of each recipe, I did my best guess and overshot by about 80 pieces. I sort of panicked when the first several people grabbed one of everything, but thankfully not everyone did that and I ended up having plenty for the crowd! So… here’s what I made. And they were all frosted with orange vanilla buttercream. I also made some bakery-style sugar cookies (every last one of them was gone!). 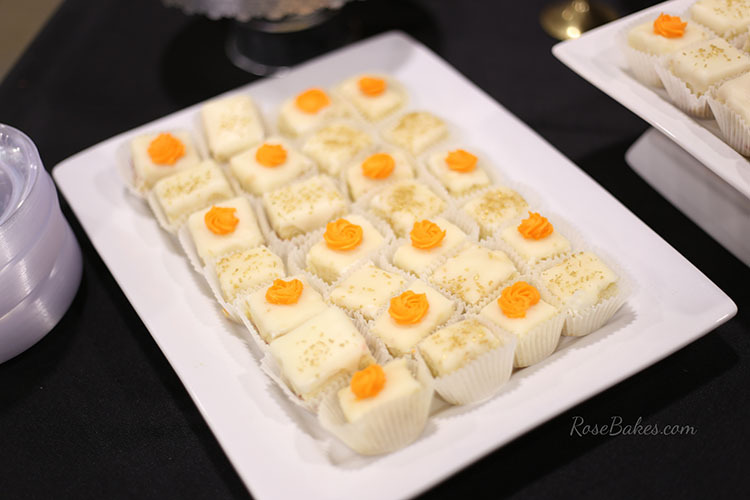 Then there were the petit-fours… my most favorite dessert of the night and a huge hit with all of the guests. 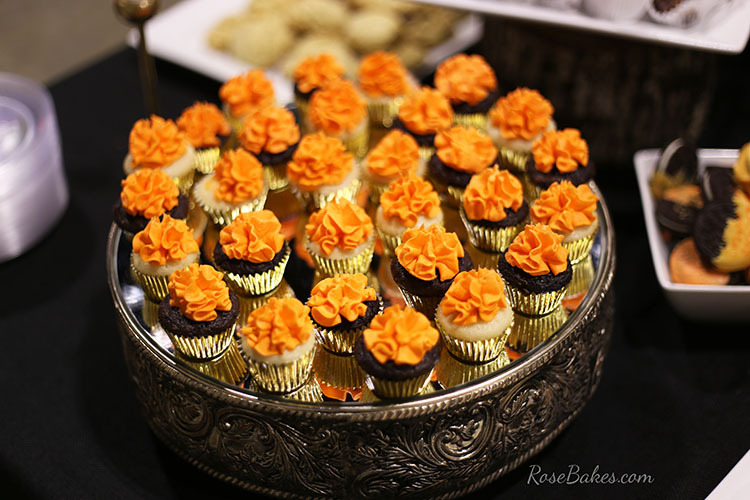 Today one of the event guests called and asked about booking a wedding a year away based on the flavor from those little bites of deliciousness! 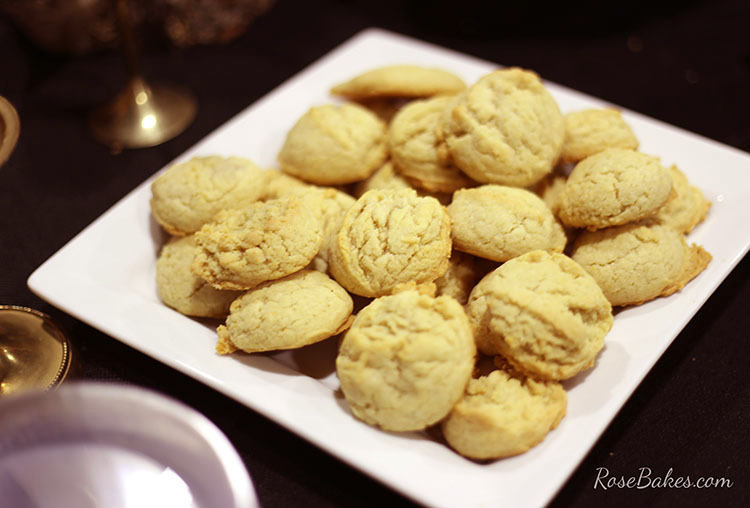 I tell ya… they’re the best thing I make (recipes and tutorial here)! 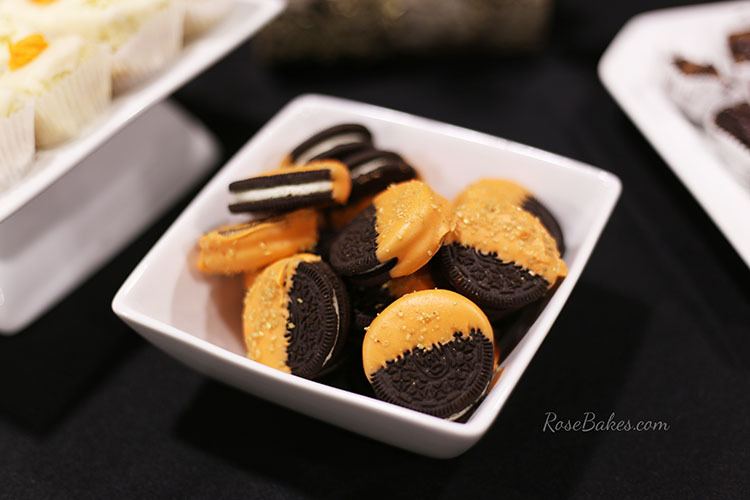 For the guests who didn’t like fussy… we made white chocolate dipped Oreos with a little gold sugar on top! I paid one of my younger boys to make these for me. He’s too young to help on a regular basis, but when I have simple jobs, he loves earning spending money! I showed him how to dip and sprinkle a couple of them and he did the rest all on his own! 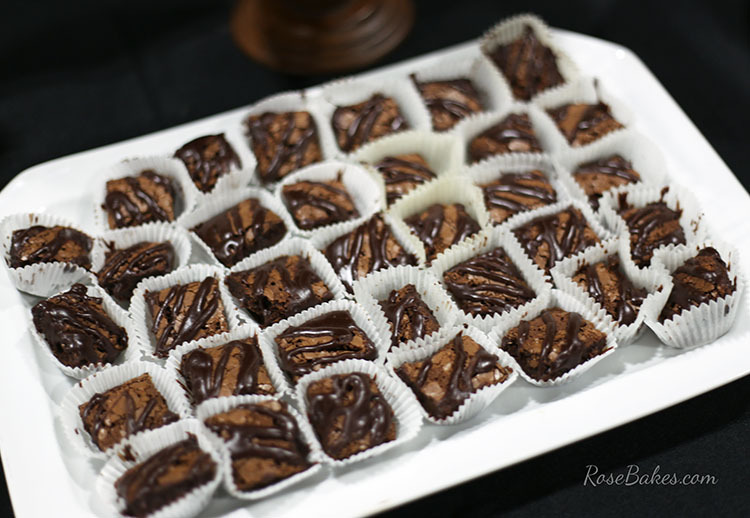 And I made these thinking of my Mama… she loves Brownies, so I made little brownie squares drizzled in ganache! 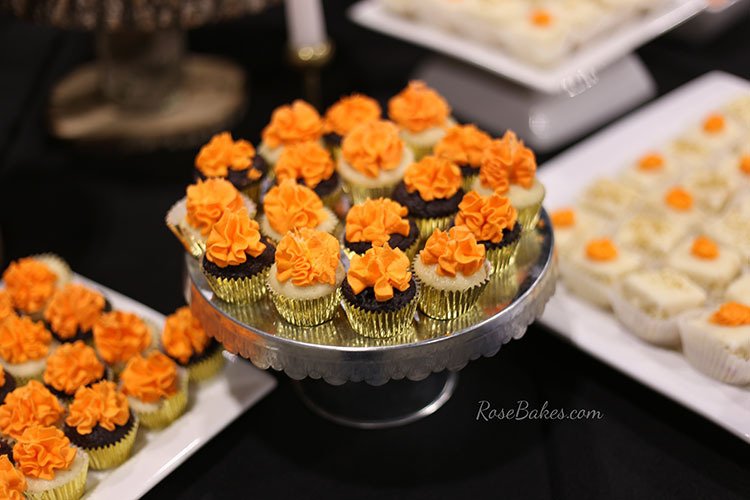 And last, but not least… I had to include bowls of candy corn all around 🙂 If you’ve followed me for any time at all, you know that’s my most favorite candy of all! I wondered if guests would think that it was cheesy, but I can’t tell you how many grabbed a handful and one man even comment that that was his favorite thing on the table 😉 Ha! 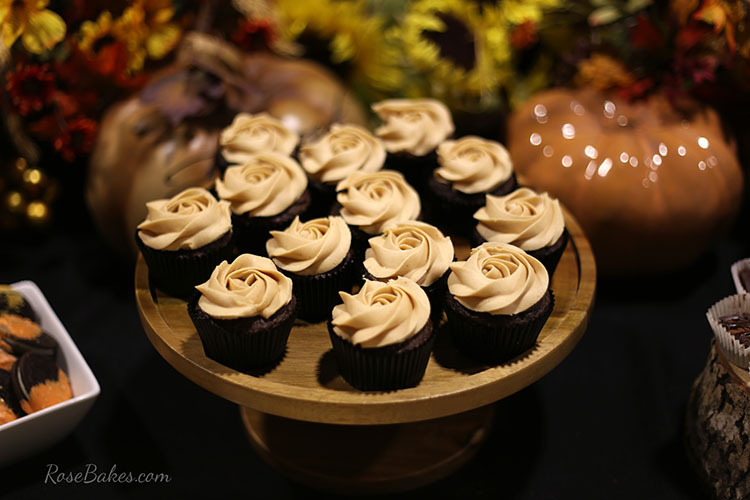 So that’s that… my Fall Dessert Table! Do you have any questions? Leave me a comment!! Very creative and delicious looking to the eye. Presentation is everything and you nailed it! I absolutely love you fall table. You and I think a lot alike in the decorating area. Beautifully laid out. I really love the Log. 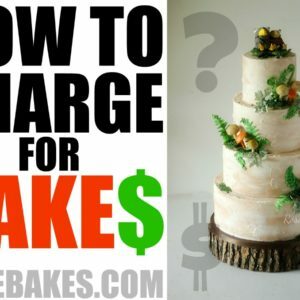 I had handmade, fresh cut slices out of different sizes of trees on different lengths on logs making up the tiers I used for my cupcakes for my husbands and mine’s Wedding Reaffirmation. To mix softness with rugged is so pretty! Anyway, I loved your table! Rose, I love following your blog, you are amazing and so is this display!! No question but you did a beautiful job. Very creative! WOW! 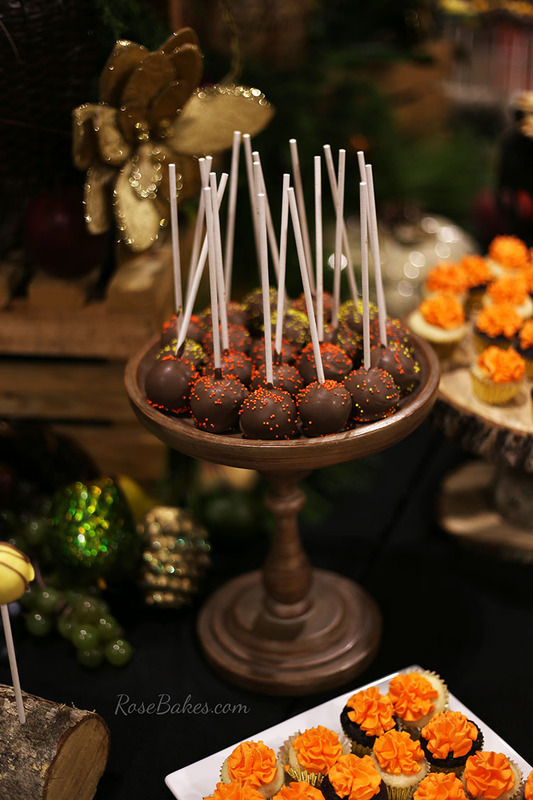 Everything at the dessert table looked fabulous! After all that work, I’m happy the electricity went off so you could get a good nights sleep! If there ever is a person with creativity, it is you Rose. You have the most amazing ideas and this event showed it. What a beautiful table with all the amazing delicious desserts you made and what a beautiful look you put to it. I know everyone was at “auh” when they went to the table to decide what to try firsthand. Great job! AWESOME table. 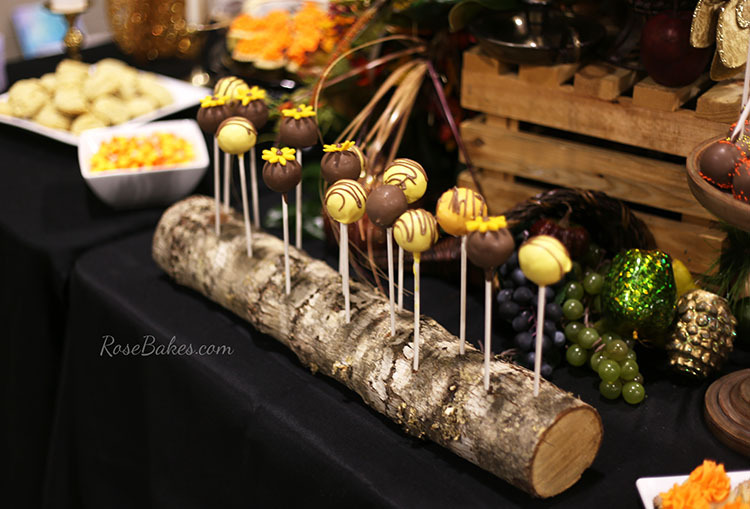 I love the cake pop log stand. My daughter and I can’t wait for candy corn to come out in the stores(its our favorite too)…we start hording so we can make it through to the end of November! Beautiful display! Sounds like you have a wonderful husband too! Enjoy your journey! Ha… that sounds just like me! Thank you! Great table display , if everything tasted as good as it looked they must have been in heaven. I used the Wilton 1M. Thanks! Everything looks gorgeous. How many different desserts do you let them pick. I have no control over that and I don’t stand and oversee the table other than to restock as needed so it’s really just a “hope” that they’ll not take more than 3 or 4.